When the Finnish immigration experience to America in the 1800s comes to mind for young readers, most will think of Jennifer L. Holm's Newbery Honor book Our Only May Amelia long before Ann Nolan Clark's All This Wild Land. That's because the former is a lot more well-known, garnering acclaim for Jennifer L. Holm at the height of her popularity, whereas Ann Nolan Clark penned All This Wild Land more than twenty years after the junior novel she's remembered for, 1953 Newbery Medal winner Secret of the Andes. To be clear, I don't consider Ann Nolan Clark's book of Finnish migration to be in the same league as Jennifer L. Holm's, Our Only May Amelia being one of the great works in the history of American children's literature. It's exceedingly rare to find a book that equals Our Only May Amelia, and though All This Wild Land isn't quite up to that monumental task, it comes much closer than I expected. Maiju's journey to and then across the U.S. with her parents in search of good land to settle on is powerful metaphorically and realistically, a resonant tale of an eleven-year-old girl's sisu (Finnish for "courage") that was published twenty-four years before Jennifer L. Holm's classic novel. Drawing on her every creative reserve as a past Newbery Medalist, Ann Nolan Clark traces Maiju's path from the only home she's ever known, in Turku, Finland, to the unfamiliar wildlands of a new nation on the opposite shore of the Atlantic Ocean, the United States of America. The U.S. of 1876 is sparsely populated, promising many acres of beautiful, secluded land for any settler with the sisu to trek through harsh wilderness to stake his or her claim, and Maiju and her parents are committed to their dream of doing exactly that. With no way of knowing what is to come, the three of them debark in America and begin the search for their destiny, all while trying to ignore the ache in their hearts from leaving Finland forever.Maiju and her parents, Äiti (Finnish for "Mother") and Isä ("Father"), have relatives in Minnesota State, and it is to these relations they turn for help in establishing their own homestead. Uncle Olavi and Aunt Marta set them up with a way to purchase the items they'll need and a guide to take them to where they can choose a parcel of land to stake their claim, also introducing them to their network of Finnish friends who will assist the family should they need it. A boy named Timo, only a year older than Maiju, grudgingly does his best to help her fit in, too, but Maiju can tell he doesn't mind her as much as he lets on. When they've found the clearing they want to make home, it's hard to believe they've really made it in this new country, provided they can prove up on the claim over a period of years. For now the land is just a meadow and a serene little lake amidst the towering trees, where the threat of Indian invasion influences every plan the family makes, but Maiju and her parents are determined to bring a small piece of Finland to their settlement. They construct a sauna from wood and stone, a tiny bathhouse where they can release the stress of each day in steamy commune, rebuilding themselves from the inside out to tackle the challenge of the next twenty-four hours. After the crop they're growing on the land is sold, they can buy materials to build a full house, and be that much closer to owning the property for good. But harsh Minnesota winters are a vigorous test for farmers, and the delicate nature of agricultural prosperity can be set back at any time by inclement weather. Maiju does her part daily to help Äiti and Isä, but the best intentions can't stop fate, and the hope of a bountiful growing season is threatened by circumstances beyond their control. Moreover, Maiju is alarmed to regularly spot Indians near their land, despite Timo's assurances that any Indians around here would be peaceful Chippewa, not the Sioux who had previously wrought violence against Finnish pioneers. The Sioux are bound by a peace treaty now, anyway, so Maiju and her parents should be safe from attack even if the Sioux were lurking nearby.Whenever the tribulations of proving up a frontier settlement miles from the nearest neighbor overwhelm Isä, Maiju quietly reminds him of one of the few Finnish words they've resolved to keep after moving to America: sisu. Isä defines sisu for Maiju and us early in the story, bringing it into the context of what they're trying to achieve in America: "The English word for it is 'courage,' but sisu means much more than 'courage.' It means to a Finn to build a new home when an enemy nation takes his land and destroys his house. It means to cut loved ties and face an unknown country to fight for a new way of life. It means no matter how frightened or difficult the task is, what a Finn begins he completes. You, Maiju, must never let fear conquer you, because you, being a Finn, have sisu. Finn and sisu are one. They are never separate." When rough luck deters Isä from his confidence that they'll make good on the parcel of land they are already coming to love, Maiju slips in next to him and whispers the word sisu, reaffirming his identity in a foreign land among people who don't know how much courage means to a Finn. Proving up the homestead isn't just about fulfilling a dream for Maiju, Äiti, and Isä. It's remembering who they are, estranged now from the motherland by which they still define themselves. It's holding on to a crucial piece of Finnish heritage they won't relinquish even as they assimilate most of American culture. It's staying true to their hearts in an ever-changing world and bringing the best of Finland to America, demonstrating why they are proud of their homeland and that it is a worthy identity they sacrificed to become Americans. The melting pot of the United States only works if everything in the pot is melted together as one, but the smelted metals retain their distinct mineral composition. It is for the diverse richness of material that the mixture in the pot is worth more than its weight in gold.How could an odyssey of this magnitude, from icy Finland to snowy America to prove up on land they've never seen, be completed without exacting an enormous toll? The cost of the family dream turns out to be a devastating one for Maiju, whose sisu is tested to the breaking point by the catastrophic loss that rocks her world just as the settling process begins to look like it might be accomplished after all. Freezing winter days and nights passed working the land as a family become lonesome, wistful evenings spent in solitary remembrance of what was. To Maiju, it's as if she is losing everything she holds dear, every remnant of her life in Finland and even the positives of her family's American conquest, all interred beneath the old oak tree on their property as the world settles into a stagnant, inescapable twilight. Her mother's words are truer now than ever, even as Maiju stubbornly turns away from them: "Many things will hurt you and me for we are very much alike. But will these things hurt us less if we refuse to accept them? Can we ease our hurts by refusing comfort from those who love us?" But sympathy from grieving friends and family isn't enough for Maiju now, as her dreams lie buried six feet under the land she and her parents worked so hard to deserve. The homestead still demands to be proved up on, providing new work every day that has to be done, but Maiju doesn't know if her heart will ever again be in her labor. What good is sisu if it ends in tragedy? What is special about Finnish fortitude if it leads to a sad, lonesome end? But Maiju isn't alone on her land or in her feelings of lostness. She's not the first Finn bereaved by the cruel potentialities of homesteading, and others who know the pain in her heart can stand with and help her if she'll let them. Enduring what the future has in store without a clue what that might be is never going to be easy. "I wonder if I can learn to accept what is? ", Maiju poignantly asks herself. It's the lingering question of the story, the answer to which will determine if Maiju can ever be happy longterm. It's the question we each must answer as we face the hardships of life. All This Wild Land is a powerful story of immigration, naturalization, family love and togetherness, and of course sisu, and it's just as relevant to anyone facing adversity in their own lives as it is to migrants like Maiju and her parents. Leaving behind what's familiar is always a source of apprehension. We've loved, shared lasting memories, and made our lives in one place, but eventually the time might arrive to move on from there, and it's frightening to think of pulling up stakes and heading somewhere foreign to us. But that move might be what we need to transition into our next stage of personal growth, despite the wonderful things we're leaving behind. As we travel with Maiju into the interior of the Midwest United States, traipsing through swamp and across open prairie to the windswept meadow where their new house is going to be, we see there's not as much to fear about the unknown as we thought. There can be joy, excitement, and good humor beyond the familiar world we once thrived in, and it can eventually nourish our souls no less than what we used to have. Even should tragedy strike, the brave choice to forge ahead to our next frontier wasn't wrong, and can still be made good in spite of the loss than hangs heavy on our hearts. Maiju is a realistic example for us to observe and see there's a lot more life poised beyond the next horizon, if we have the sisu to pack up our things and light out after it. Our destiny is waiting, as Maiju's was. It's up to us to go meet it.The United States of America was a young nation in 1876, when All This Wild Land is set. We were scarcely ten years removed from the Civil War and Abraham Lincoln's transformative presidency, still figuring out what we wanted America to be. Äiti's friend Liisa speaks insightfully of her questions about America's future in conversation with Äiti and Maiju one day: "America is a good country...but you work for what you get, and sometimes like everyone everywhere you don't get what you want even when you work hard for it. America is new and big and unused. My Victor [Liisa's husband] tells me that this year the United States is a hundred years old. But what will it be when it's two hundred years old or five hundred years old? Good people are making it a good place today, but will there always be good people to keep it good?" It's a straightforward, piercing question, as germane in 1876 as in 1976, today, or hundreds of years from now. The question of America's future will never stop depending on what good people can and are willing to do to help the country maintain its potential. Time slips away so quickly in life, but more so when one is engaged in rigorous outdoor work, daily existence consisting primarily of arduous physical labor in between periods of sleep at night. "The days are like deer leaping into the forest," Maiju marvels. "(T)hey go so fast." Even a wondrous day of just being together with ones who have been dearly missed, or perhaps especially such a day as that, is fleeting and can never satisfy the ultimate longing of our hearts. As Äiti poetically puts it, "But even a day out of heaven has to end." When Maiju's day out of heaven in America ends, it means terrible pain for a long time, but it's sisu that again offers to save her; sisu, which kept her father's and her own hopes aloft on numerous occasions and will continue to do so as long as Maiju holds on to that portion of her Finnish inheritance. It's Victor who says it best: "(H)oping is a big part of homesteading. Hoping and trying again when what you hope for doesn't come." The land will remain Maiju's as long as she keeps her sisu. And if she has sisu, she'll never be without Äiti and Isä.Ann Nolan Clark does a tremendous job taking one big idea and working it all through a story, like dough leavened with yeast. She did this in Secret of the Andes with Chuto the shepherd's advice to young Cusi: "Grieve not if your searching circles." It is a gentle reminder not to be frustrated by the circuitous routes of life, which often wind around and about in baffling ways before we begin understanding who we are and where we are going. Like Secret of the Andes, All This Wild Land takes an important philosophical idea and spreads it through the story, but this time it's the link between the words sisu and "try." Real courage isn't believing against the odds that one can engineer a positive outcome from a situation right away. Sisu is having the guts to keep climbing the same mountain over and over and over, no matter how many times one slides all the way back down while attempting the ascent. It's being tenacious enough to continue past every boulder of discouragement and frustration thrown down on us, and to top the summit in the end not because we cleverly discovered a secret passageway there, but because we simply outlasted our opposition. That indomitable spirit, that sisu, is something everyone can possess right now if they're willing to try long and hard enough. Sisu and "try". They go hand in hand, inseparable without severing both words from what they truly mean. And that concept forms the heart of this book. Secret of the Andes was Ann Nolan Clark's Newbery winner, the book for which she will probably always be best known. I do love it, but for my money I'm taking All This Wild Land over Secret of the Andes, without a doubt. Every bit as philosophically potent as its more famed sibling, All This Wild Land is significantly more powerful on an emotional level, and I don't hesitate to give it three and a half stars; I almost rounded up to four. A sound argument can be made that it deserved a 1977 Newbery Honor (not the Medal, since it was up against Mildred D. Taylor's Roll of Thunder, Hear My Cry and Irene Hunt's The Lottery Rose). 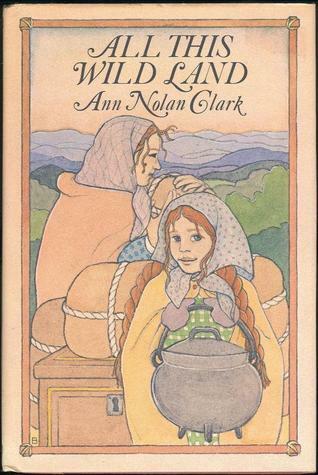 All This Wild Land has raised my opinion of Ann Nolan Clark even higher than it was, and I wasn't anticipating that when I decided to read the book. I urge lovers of juvenile literature to give this novel a try, and I hope its merits will one day be more widely known. All This Wild Land is a special story.